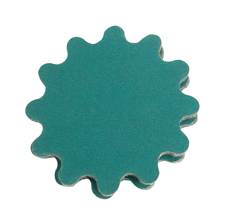 We now offer the popular Green Discs in the Wave Shape. The edge overhangs the holder by 1/4" to prevent the disc from digging into the turning. This shape also makes it easier to touch up trouble spots on a work piece while the lathe is stopped. They feature heavy J-Flex cloth backing for toughness and flexibility. The Green Wave discs that fit the 2" hook and loop holder measure 2-1/2" in diameter while the Green Wave discs for the 3" holder measure 3-1/2" in diameter.